• Speed limits for towing a trailer vary by state or province. Do not exceed the posted towing speed limit. • Toyota recommends that the vehicle-trailer speed limit is 65 mph (104 km/h) on a flat, straight, dry road. Do not exceed this limit, the posted towing speed limit or the speed limit for your trailer as set forth in your trailer owner’s manual, whichever is lowest. Instability of the towing vehicle-trailer combination (trailer sway) increases as speed increases. Exceeding speed limits may cause loss of control. • Before starting out, check the trailer lights, tires and the vehicletrailer connections. Recheck after driving a short distance. • Practice turning, stopping and reversing with the trailer attached in an area away from traffic until you become accustomed to the feel of the vehicle-trailer combination. 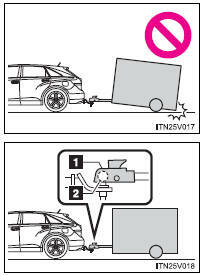 • Reversing with a trailer attached is difficult and requires practice. • As stopping distance is increased when towing a trailer, vehicle-tovehicle distance should be increased. For each 10 mph (16 km/h) of speed, allow at least one vehicle and trailer length. • Avoid sudden braking as you may skid, resulting in the trailer jackknifing and a loss of vehicle control. This is especially true on wet or slippery surfaces. • Avoid jerky starts or sudden acceleration. • Avoid jerky steering and sharp turns, and slow down before making a turn. • Note that when making a turn, the trailer wheels will be closer than the vehicle wheels to the inside of the turn. Compensate by making a wider than normal turning radius. • Slow down before making a turn, in crosswinds, on wet or slippery surfaces, etc. • Take care when passing other vehicles. Passing requires considerable distance. After passing a vehicle, do not forget the length of your trailer, and be sure you have plenty of room before changing lanes. • To maintain engine braking efficiency and charging system performance when using engine braking, do not put the transmission in D.
Transmission shift range position must be in 4 in the S mode. • Instability happens more frequently when descending steep or long downhill grades. Before descending, slow down and downshift. Do not make sudden downshifts while descending steep or long downhill grades. • Avoid holding the brake pedal down too long or applying the brakes too frequently. This could cause the brakes to overheat and result in reduced braking efficiency. • Due to the added load of the trailer, your vehicle’s engine may overheat on hot days (at temperatures over 85°F [30°C]) when driving up a long or steep grade. If the Engine coolant temperature gauge indicates overheating, immediately turn off the air conditioning (if in use), pull your vehicle off the road and stop in a safe spot. under both the vehicle’s and trailer’s wheels. release the brakes slowly until the blocks absorb the load. the engine. Be sure to keep the brake pedal pressed. pedal, and slowly pull or back away from the wheel blocks. Stop and apply the brakes. No matter which class of tow hitch applies, for a more safe trailer hookup, the trailer ball setup must be proper height for the coupler on the trailer. • Ensure that your vehicle’s tires are properly inflated. • Trailer tires are inflated according to the trailer manufacturer’s recommendation. • All trailer lights work as required by law. • All lights work each time you connect them. • The trailer ball is set at the proper height for the coupler on the trailer. • The trailer is level when it is hitched. • The trailer cargo is securely loaded. • The rear view mirrors conform to all applicable federal, state/provincial or local regulations. If they do not, install rear view mirrors appropriate for towing purposes. • If you tow a trailer, your vehicle will require more frequent maintenance due to the additional load. (See “Scheduled Maintenance Guide” or “Owner’s Manual Supplement”.) • Retighten the fixing bolts of the towing ball and bracket after approximately 600 miles (1000 km) of trailer towing. • Firmly grip the steering wheel. Steer straight ahead. • Stop in a safe place. Get all occupants out of the vehicle. • Do not exceed the TWR, unbraked TWR, GCWR, GVWR or GAWR. • Vehicles with a towing package: If the gross trailer weight is over 2000 lb. (907 kg), a sway control device with sufficient capacity is required. • Adjust the tongue weight within the appropriate range. Place heavier loads as close to the trailer axle as possible. • Do not exceed 65 mph (104 km/h), the posted towing speed limit or the speed limit for your trailer as set forth in your trailer owner’s manual, whichever is lowest. Slow down sufficiently before making a turn, in crosswinds, on wet or slippery surface, etc. to help avoid an accident. If you experience a vehicle-trailer instability from reducing a certain speed, slow down and make sure you keep your vehicle speed under the speed of which you experience the instability. • Do not make jerky, abrupt or sharp turns. • Do not apply the brakes suddenly as you may skid, resulting in jackknifing and loss of vehicle control. This is especially true on wet or slippery surfaces. • Do not exceed the trailer hitch assembly weight, gross vehicle weight, gross axle weight and trailer tongue weight capacities. • Do not use cruise control when towing. • Slow down and downshift before descending steep or long downhill grades. Do not make sudden downshifts while descending steep or long downhill grades. • Vehicle-trailer instability is more likely on steep long downhills. Before descending steep or long downhill grades, slow down and downshift. Do not make sudden downshifts when descending steep or long downhill grades. Avoid holding the brake pedal down too long or applying the brakes too frequently. This could cause the brakes to overheat and result in reduced braking efficiency. • Do not tow a trailer when the compact spare tire is installed on your vehicle. • If the gross trailer weight exceeds unbraked TWR, trailer brakes are required. Toyota recommends trailers with brakes that conform to all applicable federal and state/provincial regulations. • Never tap into your vehicle’s hydraulic system, as this will lower the vehicle’s braking effectiveness. • Never tow a trailer without using a safety chain securely attached to both the trailer and the vehicle. If damage occurs to the coupling unit or hitch ball, there is danger of the trailer wandering into another lane.